Overview: This program runs a double auction in which buyers and sellers submit bids and offers in any order. This is called a double auction because bids tend to increase as in an English auction (e.g. for antiques), and at the same time, offers tend to decrease. Thus the bid-ask spread will narrow until one of the bids or offers is accepted. Payoff Parameters: Seller units are given "costs" and buyer units are given "values". All values and costs are random draws from uniform distributions that you specify (rounded to the nearest dollar), unless you choose to enter your own values and costs. Sellers earn money by selling above cost, and buyers earn money by buying below value. You choose the number of rounds, and you have the option of switching to a new set of payoff parameters after a specified number of rounds (e.g. demand or supply shift, tax, price ceiling or floor). The instructions are automatically configured to conform to the parameters you select, and your instructor results page calculates data averages and competitive predictions by round and by treatment. Discussion: The discussion can focus on the relationship between the trading data and the competitive (supply and demand) predictions. For a discussion of behavior in laboratory double auctions, see Davis and Holt (1993), Experimental Economics, Princeton University Press. The first laboratory double auctions are reported in Smith (1962) "An Experimental Study of Competitive Market Behavior," Journal of Political Economy, 70(3), 111-137. 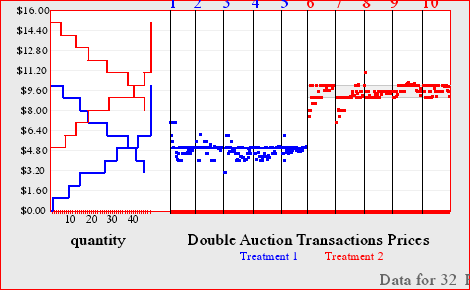 Laboratory double auction experiments are surveyed in Davis and Holt (1993), Experimental Economics, Princeton University Press and in Holt (2006) Markets, Games and Strategic Behavior, Addison-Wesley. The first laboratory double auctions are reported in Vernon Smith's classic 1962 paper in the Journal of Political Economy.